It’s Christmas in July! You’ve got a full six months until Christmas, but now is the time to start planning. This month we’re going to talk about Christmas planning. 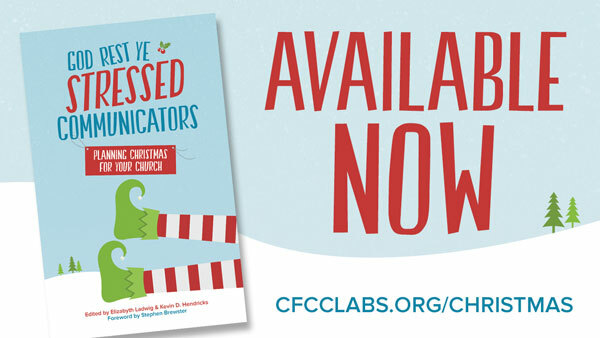 For more Christmas help, check out our church Christmas ideas or our book, God Rest Ye Stressed Communicators: Planning Christmas for Your Church. Tell us about your favorite Christmas service. What made it a special experience? When God’s people gather to celebrate the birth of Jesus, amazing things happen. My favorite Christmas Eve service was in 2013. We made it a big family night including horse-drawn carriage rides, a family photo booth, hot chocolate and activities for the kids. The worship team even made snow fall from the ceiling to end the night with a surprise. I don’t have one particular favorite service, but I really enjoy attending the services in the evening (we have services starting mid-afternoon all the way to 10 p.m.). The sanctuary is dark with a real “romantic” feeling with cheerful worship music that lifts the spirits, a message from the pastor and candle lighting that warms the soul. We had a Les Mis “ChristMIS Eve” Service. Being a church with locations in the Manhattan-facing bedroom communities of Jersey, we happen to have a couple of serious Broadway actors in our congregation. We were able to weave together a Christmas sermon experience that incorporated story, song and Scripture. And the message really resonated since Les Mis itself shows why grace is for giving—totally appropriate for sharing how God gave us his grace through Christ. It was my favorite because it was the intersection of so many factors: It was highly invitational, we involved volunteers in ways that shared their gifting in the arts, this was a Christmas sermon where no one dozed off!, the core message was really easy to understand and receive by all ages, the event and message was memorable, and in terms of outreach promotion it was very easy to communicate. We were able to weave together a Christmas sermon experience that incorporated story, song and Scripture. We made a movie! Surrendered. We told a real story of a family who were in crisis and didn’t have anything to celebrate. We did this through film. And it was amazing. We wrote songs to provide a soundtrack and we allowed the movie to present the gospel! (The movie is now available on Netflix). At National Community Church, we are unique in the sense that most who live here are not from D.C. We are aware that senators, congressman and their staffers head home for Christmas to be with family/friends. With that in mind, NCC typically pares down to one service on Christmas Eve (from our usual 13 services). Even though we only have one service that weekend, we are intentional about making the service an impactful one. We invite anyone in town to join us for a family-friendly service, including a live nativity on stage and a live reading of “The Christmas Story.” Afterward, we encourage families to take selfies with llamas, sheep and the like! It is a service that our communities remember and look forward to each year. At NCC, we are orthodox in doctrine, but a little unorthodox in practice and this service is one way we try to break the mold. No matter when I am asked this question, my answer is always the same: The most recent one. Every year, I am surprised—awed—by the ways that God becomes present in our community and in our Christmas worship. I love the way that the raucous celebration with the angels and the quiet reflection of the silent night co-exist within those services. I love the way that the whole community takes part in the service in a variety of ways. When God’s people gather to celebrate the birth of Jesus, amazing things happen. God is with us, often in ways that are hard to quantify.